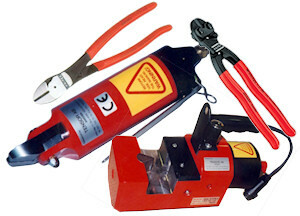 These tools are selected for their ability to stand up to extreme service and cut even the hardest wires. 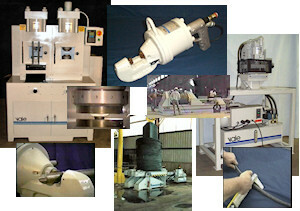 These include hand cutters, pneumatic cutters and hydraulic cutting tools. Vale Industries builds heavy duty equipment for Steel Mills, Wire Processors and Continuous Casting Plants including hydraulic shears capable of shearing up to 63mm diameter steel rods and 89mm diameter copper/aluminum sections. For quality control, Vale offers a wide range of Upset Testers capable of testing rod up to 89mm diameter. Our transformer accessories are produced by Weisser Spulenkörper and Adels-Contact, both located in Germany. Design software is created by Rale Engineering of Switzerland. 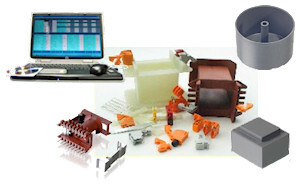 ADELS contact offers a wide range of specialized terminal blocks for transformers. WEISSER of Germany molds precision bobbins, potting boxes, toroidal mounting accessories and terminal strips used to mount ADELS terminals. The worlds most powerful Transformer Design Software, used to design transformers and chokes/inductors from the smallest, extremely high frequency designs to large oil cooled distribution systems, is available from Rale Engineering. Big bobbin: Metric EI192 fits 2.5" USA laminations.